Here are just a few examples featured in our Sustainable Living Report which show how we’re innovating for impact. As a packaged goods company we’re acutely aware of the impact of plastic packaging. We're pioneering new technologies and business models to further our strategy of using less plastic, better plastic and even no plastic at all. And where we do use plastic, we’re committed to transitioning to a circular economy. In Indonesia, we're piloting a breakthrough technology on multi-layer plastics used in sachets. This aims to turn used sachets into new polymers on a commercial basis. If successful, it could herald a way to make sachet recycling more circular for us, and for industry as a whole. We're innovating business models, too. In our new partnership with Loop™, a waste-free shopping pilot, products are shipped directly to consumers, then returned and refilled. Some of our brands have developed new formats for the platform, such as refillable deodorant sticks and toothpaste tablets. Our biggest water impact happens when consumers use our products to shower, bathe or clean their clothes. Although we've had some success with behaviour change programmes designed to reduce use, progress hasn't been fast enough. We're developing new products and formulations that work with less water, poor quality water or even no water. Domestos’ innovative Flush Less toilet spray disinfects and eliminates malodours without the need to flush. This novel yet simple solution has the potential to make a big impact. 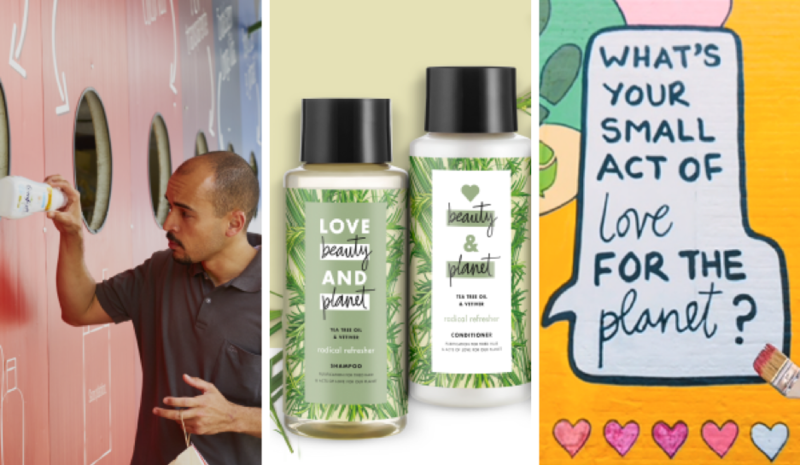 We also launched our Love Beauty and Planet haircare range, whose conditioners use innovative fast-rinse technology, saving consumers time and water. We have the potential to positively impact the lives of millions through our value chain. One important group is small-scale retailers in emerging markets, who are often women. Innovations in digital and e-commerce can unlock barriers to improving incomes and growth, building on our Shakti micro-entrepreneur model. Our Jaza Duka initiative in Kenya – a partnership with Mastercard – digitises the processes of buying supplies and selling goods, allowing retailers to build the credentials to access bank loans. This gives them better control of their inventory, so they can stock up to meet consumer demand. In Rwanda, Kasha is an e-commerce and content platform within our TRANSFORM partnership that confidentially sells and delivers women’s health and personal care products. It’s a novel distribution system that empowers women and enables growth. Poor hygiene and sanitation, lack of safe drinking water and low self-esteem affect millions of people every day. Our health and hygiene brands such as Lifebuoy, Signal / Pepsodent, Dove, Vaseline, Domestos and Pureit aim to tackle these issues head on, and contribute to several Sustainable Development Goals too. As the number one antibacterial soap brand, Lifebuoy runs one of the world’s biggest handwashing programmes and has reached a billion people since 2010. Together, our brands have reached 1.24 billion people. We’ve made good progress on reformulating our products to reduce salt, sugar and fat – 48% of our portfolio by volume now meets our Highest Nutritional Standards, based on globally recognised dietary guidelines. Today, more and more people want to increase the proportion of their diet that contains plant-based foods made with natural ingredients. Meeting this demand fits perfectly with our vision of sustainable business growth, and our portfolio kept growing in 2018. We’re increasing our offering of vegan/non-dairy products. Ben & Jerry’s, Cornetto, Magnum and Breyers all have non-dairy variants. And in 2018, we acquired The Vegetarian Butcher, which aims to be the largest butcher in the world through its plant-based portfolio. Our 2018 Sustainable Living Report sets out our strategy for sustainable growth and more examples of how we’re delivering on the Unilever Sustainable Living Plan, including an index showing how our actions contribute to the UN Sustainable Development Goals.